Puppies due first week of June! Puppy Profile: These puppies will have beautiful black and red pigment and nice structure. They will be suitable for show, breeding, service, obedience and make excellent family companions. Odin is DM clear so the puppies will not be at risk for this disease. Dam Profile: Pia von Lotta is a large and strong female, with excellent red color and dark eyes. She is a playful, sweet and loving, yet a powerful dog with excellent drives and energy. Pia loves her family and loves to play. 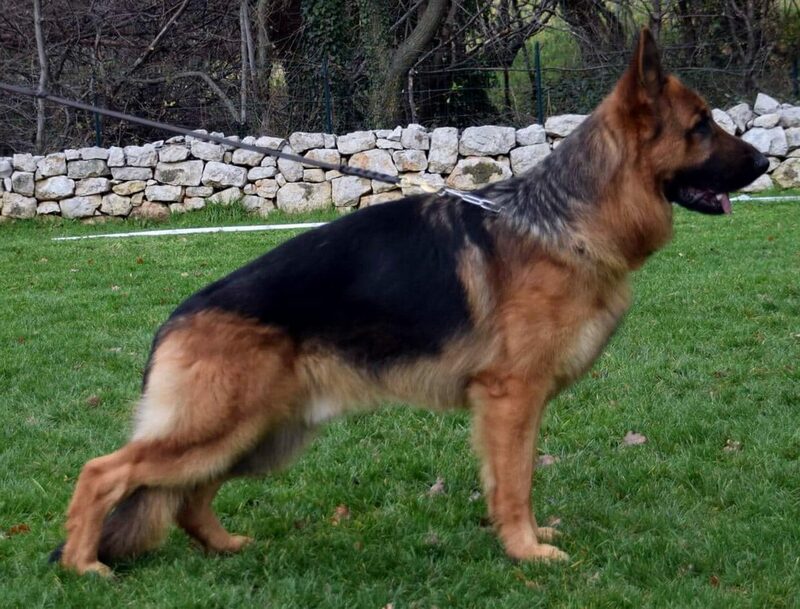 Pia comes from an outstanding German pedigree full of V/VA rated and Schutzhund titled dogs. Her father is V1 (BSZS) Arre vom Huhnegrab and her mother is VA1 (USA) Wiva vom Zellwaldrand. Her grandparents include VA Lennox von Regina Pacis and VA Etoo aus Wattenscheid along with other greats including V Tyson vom Kottersbusch, 2X VA Dux de Intercanina and VA Paer vom Hasenborn. Pia's hips and elbows are rated A1/A1, the highest European rating and she has passed her OFA cardiac clearance. Pia will pass along her fabulous temperament and rich color to her pups. Stud Profile: VV Odin Belona is a young, beautiful black and red male with excellent black and red pigment and an outstanding temperament. Odin has is IPO1 title and loves to play and please and he absolutely loves people of all ages. Odin is the son of VA2 Willas vom Grafenbrunn and the grandson of V Tyson Kottersbusch. His pedigree on his father line also includes VA Quenn vom Loher Weg and VA Zamp vom Thermodos. Odin's mother is V Jara Belona. On his mother's side, his pedigree includes outstanding dogs such as VA Kronos von Nurburgring, VA Ensoch von Amasis and VA Tipo Belona. Odin's hips/elbows are A2/A1 and he has been tested for degenerative myelopathy and is clear (DM clear). Odin has also passed his OFA cardiac exam.